Like birds flying south towards warmer climes, several GOD USA satsang devotees flew (and drove) south last week for the warm embrace of our Guru Maharaj at the Houston Namadwaar. 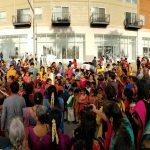 Devotees from Boston, New York, Chicago, Seattle, San Jose, Redding, Chico, Dallas and Houston were all there to celebrate the first birthday of Sri Swamiji’s American baby—the Houston Namadwaar—which shares its birth anniversary with the great avatara purusha who was also an exponent of the Mahamantra, Sri Krishna Chaitanya Mahaprabhu. The 3-day anniversary celebration of Houston Namadwaar was filled with Nama sankirtan, prayers, giving programs and cultural performances, all based upon the underlying theme of universal love that Namadwaar stands for, in line with our Guru Maharaj HH Sri Sri Muralidhara Swamiji’s vision. Sri Swamiji’s Holy Padukas from Boston presided majestically over the entire proceedings, silently showering His Grace on all who were blessed to visit Namadwaar over the weekend. On Friday, March 18 Akhanda Mahamantra Nama sankirtan was performed from 8 AM to 6 PM. From 4 PM to 6 PM the prayers were dedicated specially towards peace and harmony in the local community. 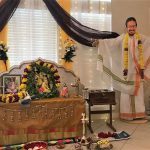 This was the big day—Sri Chaitanya Mahaprabhu’s jayanti and the day of Houston Namadwaar’s birthday bash! The day dawned sunny and glorious (as expected) despite overnight showers (after all, will the Lord not provide a beautiful, bright backdrop for His own loving birthday celebrations?). The Namadwaar grounds were green and glistening with morning dew. Birds chirped merrily in the trees. Bees buzzed around, dancing to the tunes of the Mahamantra that could be heard constantly from the Namadwaar sanctum. Sudden peals of laughter were heard now and then as children played everywhere. A couple of outdoor event tents had been pitched in the ample space behind Namadwaar. Chairs were all arranged in order. The home-made stage was set and so was the bright blue backdrop that sported peacock feathers alongside a pair of flutes and the new GOD logo at the top, a diya with its flame signifying the dispelling of darkness through love, in the middle, and the Mahamantra at the bottom signifying the base of the light (diya) that leads to “God”. The morning events, which primarily revolved around giving back to the community with food, clothes and educational supplies drives, began at around 10:30 AM. Numerous boxes of gently used clothes as well as vegetarian non-perishable food had been collected (some of it by the generous contributions of families living in the community located opposite Namadwaar) by the satsang members to be given away to the Pearland Neighborhood Center (PNC), a local agency that serves the needy in the Pearland/Manvel and nearby areas through a variety of social service programs. Ms. Sondra Huddleston of PNC was present at Namadwaar on 19th morning to take part in the proceedings and receive the donations. Also present were several youngsters from the Bhutanese community in Houston for whose benefit an educational supplies drive (comprising backpacks, notebooks and calculators) had been held. After the guests were welcomed and honored with flowers and mementos, Sri Sriram Ramanujam gave a brief overview about G.O.D.’s vision, worldwide activities and service programs across the world. He underlined the words of Sri Swamiji that Divinity and Humanity are inseparable, and emphasized that universal love and harmony was the strong thread that united all the efforts of G.O.D., whether it was praying and chanting the Divine Name; conducting food, clothes or city-cleaning drives; supporting children’s education; counseling seniors, prisoners or young orphaned children; or any of the several such social service programs that are being organized in different parts of the world. Ms. Sondra Huddleston then spoke a few words about the wonderful service PNC does for the community that include running a pantry, medical assistance, emergency assistance, disaster relief, basic living skills course and more. Sri Narad, a high-school student who was one of the representatives of the Bhutanese community at Namadwaar that day, also spoke for a few minutes. His words showed the courage that the Bhutanese youngsters have, despite the challenges they have had to face because of displacement from their own land and having to adjust to living in a new country and new culture. “May this charity put me in a state where I can give more! May this charity bring peace and happiness to the receiver! May this charity make me a more humble person! The boxes of clothes, food and school supplies were then handed over to Ms. Sondra Huddleston and Sri Narad by Sri Narayanan Sathiamoorthy. Sri Ramaswamy gave the vote of thanks to end the morning’s proceedings. After a break of a couple of hours for a delicious lunch, everybody returned to the tents outside. The Honorable Mayor Delores Martin of Manvel city arrived at 2 PM sharp. She was taken to see the Namadwaar and spent considerable time there listening to the chanting and looking at the sayings of Mahans that adorn the Namadwaar’s walls and also the photo collage of various G.O.D. activities in the US and across the world. She was then invited outside where everyone had assembled. Smt. Zenitha Ram was the “MC” for the program. She invited the Mayor onto the stage along with Sri Jeevan Nair and Sri Narayanan Sathiamoorthy. After a spirited rendition of the US national anthem by accomplished 14-year-old singer, Shilpa Sadagopan, Sri Srini Balakrishnan gave the welcome address and read out Sri Swamiji’s message for the anniversary. In His message, Sri Swamiji spoke of the sweetness of the path of Bhakti and the joy of singing the glories of Bhagavan together as a group, and blessed all the members of the G.O.D. USA family who had come all the way from across the country to celebrate the first anniversary of Namadwaar and Chaitanya Mahaprabhu jayanti. Sri Jeevan Nair then gave an overview of G.O.D. USA activities and the activities at Houston Namadwaar. Following this, Mayor Delores Martin, who has been a great support to the Namadwaar in the last year, was invited to speak. She spoke a few short but sweet words that expressed her enthusiasm and gratitude to be able to attend the Namadwaar anniversary just like she had the inauguration last year. Sri Narayanan Sathiamoorthy then spoke about Universal Love and the underlying principle of G.O.D. which is Universal Harmony through Inner Transformation, Inner Transformation through Spiritual Awakening, Spiritual Awakening by Chanting the Divine Name. He spoke of how we only “fall” in worldly love but always “rise” in Divine Love and that that Divine Love—Love of God—is the one that can take each one of us to the ideal of Universal Harmony. 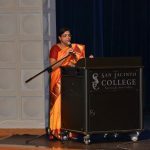 Ms. Ranjana Narasiman and Mr. Tupil Narasiman represented the Meenakshi Temple Society of Pearland and gave their best wishes for the function. Honorable Maaji and Shri Chandraji representing Shirdi Sai Jalram Mandir of Houston and Mrs. Tara Narasiman representing Hindus of Greater Houston were special attendees of the evening program. Following this, the Mayor was invited to commence the tree sapling planting. About 17 saplings of beautiful flowering trees were planted behind Namadwaar, by each of several guests and satsang members, in a temporary area. They will later be transplanted to different locations within the Namadwaar grounds. While the tree planting was going on, some satsang members were very busy—they were setting up the stage for a puppet show! And this was only the beginning of the most fun part of the day’s programs: the cultural performances. The Dancing Peacock Puppet Company, started by the Seattle G.O.D. satsang and currently a “rocking band” in the Seattle area (as a satsang member put it), set the tone for the evening with an awesome performance that had children and adults alike laughing and smiling all the way through. Kutti Kitta, the “dancing peacock” mascot, stole the show with his witty one-liners and slapstick jokes. The exotic string puppets depicted a Tenali Rama story that was full of interesting characters—the vain Maggi aka Maragathavalli, Thimma, Pumma, and the clever Tenali Rama himself. The stage, its cover and decoration, and backdrops were all expertly designed and built by the Seattle team along with some members of the Houston team. The show was fascinating on the whole, and everyone, including the Mayor, enjoyed it immensely. The puppet show was followed by a string of wonderful music, dance and drama performances by young artists. A group of eight young singers rendered an enchanting, sweet musical presentation based on the theme of the day—Universal Love and Harmony. Coordinated by Smt. Rajarajeshwary Bhat of Swaralayam Arts Forum, the performance was led by upcoming artistes and young Houston talents Keerthana Bhat, Kruthi Bhat and Shilpa Sadagopan. They were supported by Sanjana Rao, Vishnupriya and Vishnuvardhan Parasaram, and Muktha and Mukund Nair. The group sang many beautiful songs that spoke of love, compassion and harmony including Sant Narsi Mehta’s Vaishnava janato, Kanchi Maha Periyava’s Maitreem bhajata and Michael Jackson’s Heal the World. Following the concert, Smt. Nisha Giri gave a short explanation about the songs and the common message of universal love that they brought forth. Next it was time for the Bharatanatyam dancers to take the stage. First 12-year-old Maya Iyer of Houston, TX performed beautifully for a song on Lord Shiva, depicting His cosmic dance and the oneness of the Universe with the Lord. Next 16-year-old Suwetha Kalyan from Dallas, TX gave a scintillating performance, enacting the Sita Swayamvara first, followed by a dance for the Meera bhajan, Hari tum haro jan ki peer, that moved several people in the audience to tears as she depicted the saving of Draupadi, Prahlada and Gajendra by the Lord. Finally Suwetha danced to a few verses of Sri Swamiji’s kirtan, Kaliyaiyum bali kollum, while exhorting everyone (very gracefully!) to chant the Mahamantra. The final piece for the day’s cultural program was the Gopa Kuteeram children’s presentation of an incident from the life of Sri Chaitanya Mahaprabhu. The play depicted the compassion of Mahaprabhu and Sri Nithyananda while saving Jagai and Madhai, a couple of rogues who later became ardent devotees of Mahaprabhu. The performance (which was intended to be a serious drama) turned out to be a hit (albeit as a comedy) as the performers, with their contagious zeal and enthusiasm, had the audience in splits. However, the message of the play did get through to the audience as evidenced by later questioning. The children who participated in the play were Sanjev, Shivam, Karun, Mukund, Vishnuvardhan, Vishnu, Vyas, Vishnupriya, Nithya, Bharath and Purush, along with Muktha as narrator. The play ended the day’s program on a high and cheerful note. Sriram Ramanujam gave the vote of thanks and the day ended with the Indian national anthem. Everyone was then treated to a sumptuous multi-course dinner. The dinner though, was not the end. It was only an interim re-fueling break before it was time to get together again for Chaitanya Mahaprabhu jayanti special satsang inside Namadwaar. Mahamantra was chanted for a couple of hours following which Sri Ramanujamji discoursed (over telephone) on Sri Chaitanya Mahaprabhu’s charitram and His message of Love. The day ended with dolotsavam. 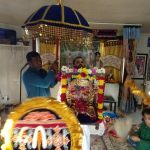 The final day of the weekend program, March 20, began early with prabodhanam and Nama sankirtan. Around 10 AM it was time for Madhura Geetham, when women from the Dallas GOD satsang beautifully rendered several kirtans composed by Sri Swamiji. 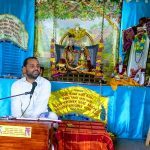 This was followed by a special Madhura Smaranam session by Dr. Bhagyanathan, who, in remembrance of the recently concluded Holi celebrations at the Madhurapuri ashram, spoke about some of Sri Swamiji’s Brindavan lilas. The audience listened in rapt attention and many were moved to tears when Bhagyaji reminisced the bhavas and sensitivity of our Guru Maharaj. After Madhura Smaranam, there was a short lunch break following which everyone once again headed outdoors for a fun quiz/game session. The session, conducted by Sri Narayanan Sathiamoorthy, was not only filled with fun as teams vied with each other to answer questions and enact answers, but was also very informative, filled as it was with questions about Sri Swamiji and G.O.D. The last session of the enjoyable week was a tete-a-tete with the Seattle puppeteering team, who explained all the angles of setting up and running the highly successful puppet shows, and all the work that goes behind it. Smt. Priya Murali, Sri Muthu Annamalai, Smt. Vaishnavi Muthu, Smt. Sandhya Anand from Seattle along with Sri Srinand and Smt. Krithika from Houston performed the puppet show the previous day. The discussion encouraged teams from other cities too to use Seattle’s expertise and start work on launching the puppet shows in their respective cities. Finally it was time to bid good-bye (or rather say “Radhe Radhe”!). Everyone left Houston with a heart that was heavy but brimming with happy memories of the weekend that was filled with satsang, with constant talk about our Guru Maharaj, and most of all filled with His Grace.